‧I-V Curve Test for Solar Cell. ‧Max. Solar cell/module Power(Pmax) search by auto-scan:60V,12A. ‧Manual Single Point I-V Test. ‧RS232C(to USB Bridge)cable for PC. TheI-V curve illustrates the electrical output profile of a PV cell, module or array and certain points on a I-V curve are used to rate the module or even the string performance. That is most of the time done in conjunction with additional software. An I–V curve characteristic changes with temperature and level of irradiance. 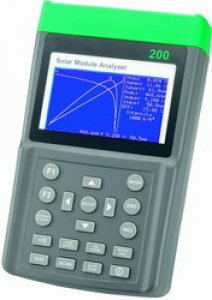 In order to trace an I-V curve all four channels: current, voltage, temperature and irradiance have to be sampled and the I–V curve analyzer has to provide a capacitive load at its own end. 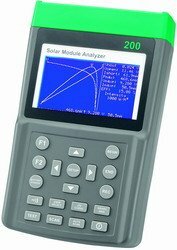 Our I–V curve analysers are used to commission solar installation or to troubleshoot and retrofit existing ones. Modules are ratted on electrical performance for the purpose of marketing and as an aid in system design. Financial incentives are most of the time granted based on performance of the solar PV system. Every PV module is delivered with a “Name Plate” ratting at Standard Test Conditions (STC) according to NEC requirements. The most significant ratted values are I-V standard values and the "Pick Power" value. Those are listed on the name plate attached to the back of the solar module. The I-V values are short circuit ampacity and the open circuit voltage measured in standard test conditions (STC) Manufacturer guaranty the pick power value for a +/- 10% of the pick power listed on the name plate. Associated to PV modules some states respective some of the utility companies require different other type of ratting certificates provided in most of the case by independent laboratories. This other set of ratings will try to match the real life cycle of a PV module. Based on the type of ratting we adopt we will have a flattening of the I –V curve with a reduction in "Pick Power" value listed for that module.